Recently I received a call from a woman who had a very active Border Collie and a new baby. As I talked with this new mom it was quite obvious she was overwhelmed and exhausted adjusting to life with a new baby and a Border Collie that was not getting the attention and exercise he needed. He was resorting to barking and other destructive pet health behaviors. The woman loved her dog but could not tolerate his deteriorating behavior and had called a rescue group to come and take him away. The rescue recommended she call me to see if I could help before surrendering her dog. Border Collies are herding dogs bred to work long hours herding livestock. They are also extremely smart. A bored Border Collie is not the easiest breed to live with, they often need a job to do to keep themselves occupied. Because these dogs are highly active, they are one of the many breeds that benefit from pet insurance. As a trainer, when discussing concerns with dog owners, I immediately start developing a training plan to solve the dogs’ issues. This was an easy one. Generally I would suggest the family involve their dog in a dog sport like agility, frisbee or herding, but this new mom and dad were too busy with the new baby to take their dog to training sessions and practices. So I had to develop a plan to help them keep their dog busy and active, without taking time away from their new baby. So here is my suggestion– laundry. Yes, I suggested we teach the dog to help his owner with the laundry. This incorporated several skills which would be useful in other areas. First, we taught the dog to pick up items and hold them in his mouth, then we taught him to carry items, next we taught him to drop items. To put it all together we put a laundry basket on the floor, asked the dog to pick up and hold a towel, then carrying the towel followed us to the laundry basket where we asked him to drop the towel. We then returned to the pile of towels and repeated this again. After a short time the dog was playing this very fun laundry game. Next we moved into the laundry room and asked the dog to get a towel out of the laundry basket and bring it to us which we then deposited into the washing machine. Ta Da! A dog that could help with the laundry. I have some clients who even ask their dogs to take the laundry out of the dryer. A good friend of mine who is a groomer trained her Australian Shepherd to take the towels out of the crates at the end of the day and take them to the laundry basket. 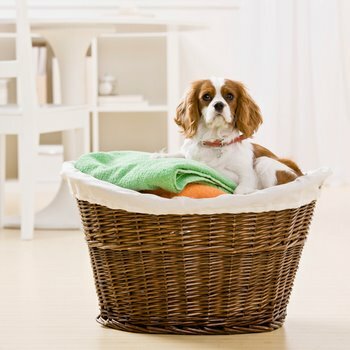 Having your dog help you with the laundry uses many useful behaviors. Take it, drop it, carry it, hold it can be useful in training other behaviors. When I drop something, I will ask my dog to pick it up and hand that item to me. So what else can you teach your dog to do around the house? They can bring you the phone when it rings, put their toys in a toy basket, close doors, cabinets and drawers with the push of their nose, go out and get the newspaper, bring you the television remote, turn the lights on and off. We even taught one dog to gather small sticks in the yard and take them to an area by the firewood pile to use as kindling. The possibilities are only limited by your imagination and the dogs’ ability. Oh, and the above mentioned Border Collie, is now happily helping his family with the daily chores, and has given up his barking and destructive behaviors! For more information about pet health, behavior and pet insurance, visit Pets Best Insurance.